The Rivercove age-restricted apartment complex is in West Deptford, at Riverwinds. CES provided full site design and permitting for this ambitious project. Rivercove Apartments is a four-story apartment complex. 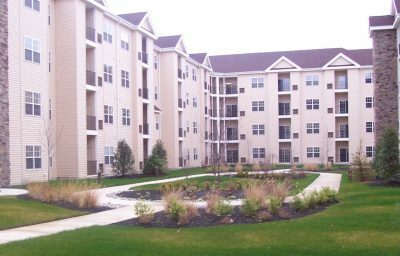 Experience with multi-family and mixed use projects like Main Street in Voorhees, and numerous projects in West Deptford, made CES the obvious choice to engineer this facility. Rivercove consists of 200 one and two-bedroom apartments for an age-restricted clientele. It includes surface parking surrounding the building as well as limited underground parking spaces. Engineering and planning required in-depth study of local sewer and water line capacity, stormwater facilities, traffic requirements, wetlands delineation, full environmental permitting, and client representation. CES also provided construction stakeout services.